Town and Gown Relations: A Handbook of Best Practices (2013), is packed with 55 chatpers, including case studies of best practices from over 40 local governments (cities/towns and colleges/gowns) in economically, politically, educationally, and racially diverse communities. 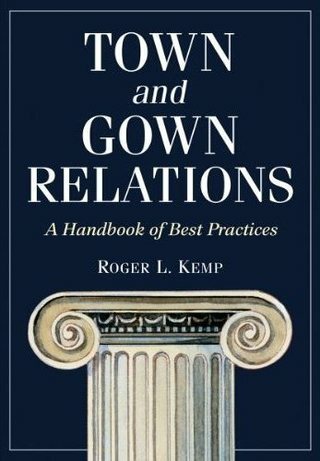 This book represents the most comprehensive resource available on town and gown relations best practices, specifically for local governments and the schools the are within their respectrive boundaries, in America. Most of the contributions focus on new practices and effective policies that have been adopted in local governments and colleges throughout the United States. The case studies in this book reflect state-of-the-art best practices in the dynamic, evolving, and adapting field of town and gown relations. Local governments (cities and towns) and schools (colleges and universities) are increasingly working together on joint projects that benefit all major stakeholders -- citizens and students alike. This volume, which took a year to prepare, represents an attempt to codify some of the knowledge in the new, dynamic, and ever-changing field of town-gown relations. The articles are organized into sections representing the primary phases of this field: a comprehensive introduction to this field, an overview of state-of-the-art best practices, and the future of town-gown relations. This edition also included contact information for the various cities and schools included in the best practices section. This gives local government officials and educational representatives an opportunity to contact on-site representatives of those case studies presented for additional information, if desired. Softcover. 2013. ISBN Print: 978-0-7864-6399-2. ISBN Ebook: 978-1-4766-0170-0. Contents: Also includes glossary, appendices, bibliography, and index.